You have to comfort the family on a Monday. Mydinnertoday’s comfort food recommendation is spaghetti with meat sauce. 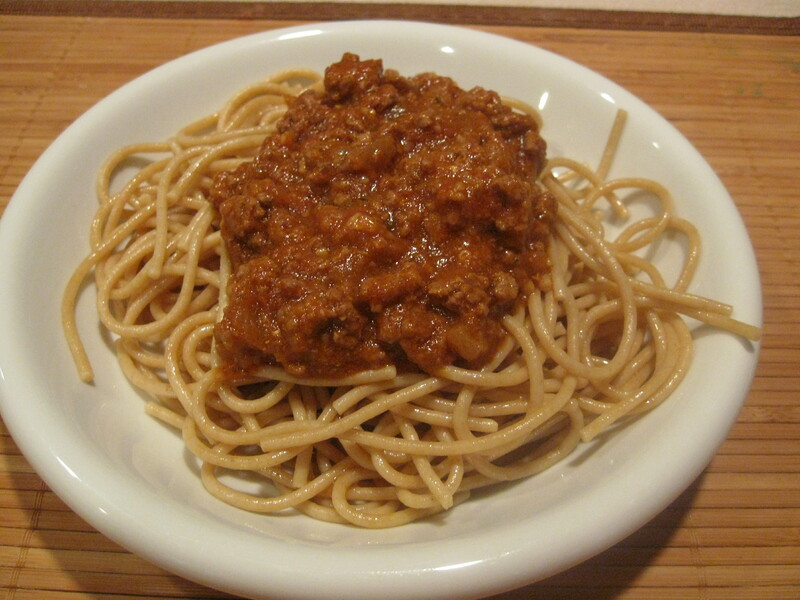 Or spaghetti Bolognese without the veggies and the milk of the traditional recipe. Add oatmeal or flax seed in the sauce for extra fiber. Enjoy and feel good. It’ll be a great week. How to make: Boil the pasta according to package instructions. Drain, rinse, put back in the pot and add a few drops of olive oil, especially if you are going to store the food in the fridge. In a saucepan, heat the oil or butter and saute the onion. Add the minced meat and saute until the meat is brown. Add the wine and cook for couple of minutes to allow the wine to evaporate. Then add the tomato sauce, maybe a bit more water, and then salt, pepper, oregano and the cinnamon stick. Cook for half an hour to 45 minutes. Remove the cinnamon stick, ladle some sauce over the spaghetti and serve with ground Parmesan on top.